Acid Liquid features a smooth Connecticut wrapper and spicy herbal infusion. 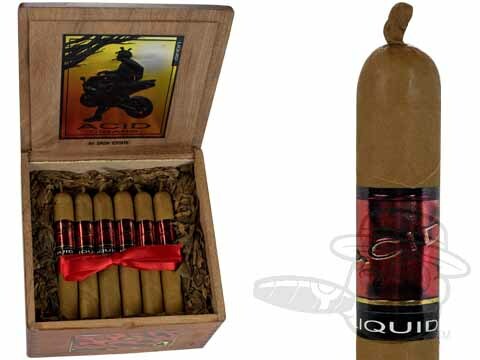 Its long finish makes it ideal for a flavorful and relaxing evening smoke, and its fantastic construction keeps it perfectly manageable all the way down to the nub.The medium-bodied Acid Liquid is a boldly-infused member of the Acid red line with heavy notes of dark wine, cashew, and floral undertones in a traditional 5x50 Robusto vitola. Maximize your savings on Acid Liquid with this special 2 Box Deal! Acids line is amazing. This is a fairly easy and quick smoke. Relax and enjoy with your favorite drink. Sweet on the lips and aroma fills the air. Acid Liquid is rated 5 out of 5 based on 3 customer ratings.